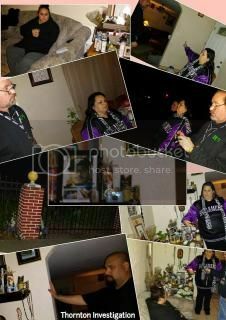 Paul Dale Roberts - HPI Co-Owner; Becky Cardenas - Lead Investigator - Spanish Interpreter; Mark Bales - Investigator. There is a shrine for Philip (deceased) in the home and most of the activity was near the shrine. Becky's K2 meter went off like crazy and it appeared to intelligently communicate with us when we were asking questions. Doing some quick and dirty EVPs, when we asked Philip if he missed his girlfriend Marian - he answered 'yes'. Many EVP sessions took place and there were strange voice like noises of a man, but they were unintelligible, then we captured the clear 'yes'. Orb photos are being taken in this residence, we will attempt to see if the orbs have intelligent movement. There is a closet in the living room and Becky's PSA-POD Programmable Sound Amplifier went off many times. Mark Bales says: "We captured an E.V.P. of music being played from one of the bedrooms also. It sounded like it came from a radio but none was turned on. It was faint, but it was definitely music." Becky Cardenas says that after I left, there were many temperature fluxuations detected in this home, using her temperature gauge. Becky and Mark captured an EVP that says 'Philip'. All of Becky's ghost hunting equipment was going off simultaneously in the home. Becky and Mark concluded that Philip is indeed in this home. Now fast forward to the year 2009/2010; I had just gave birth to my last daughter Liliana my little princess.. anyways so one evening while I was getting ready for her feeding she was on my bed and we were both facing the door towards the hall way, when my oldest daughter Victoria asked me if I just went into her room and ran out fast.. I just laughed and said that's impossible because I am feeding your sister my boyfriend was asking what happened what is going on.. we explained to him what she was saying when my boyfriend sat down on our bed and my daughter was standing in the door was to our room when me and my boyfriend just stood quiet and looked at each other in disbelief.. what we seen was shocking we had seen what my daughter had thought was me..Special Note: Could this be a doppleganger. Paul. It was a female figure in a white flowery dress.... come out her room and go out about half way to the hallway and just turn right back and went into my daughter's room... we just stood there in shock...my daughter just stood there saying what??? We didn't say nothing just stood quiet and told her nothing and just kept on going about our night. There was another scary and frightening event that happened to me while my boyfriend was at work. he worked nights at this juice plant in Bakersfield where we lived at the time. While I had a habit to leave the TV on at night just to use the light as a night light for our daughter I had dozed off in to a deep sleep... so while I was asleep I was still aware of my surroundings as I’m sure most moms are... anyhow.. so I was lying on my right side and I could feel as if my boyfriend was climbing in to his side of the bed.. the bed was kind of moving like when you feel someone crawling in not to wake you.. so I just assumed it was him. then I felt as if someone or something came up to my ear and in the most horrible voice ever say "GET OUT" I jumped up and turned around and no one was there next to me.. I was covered in goose bumps... I started crying because I had this horrible experience that I knew was real it wasn't a dream or a hallucination. I know what I felt and heard and just the environment itself was so thick and horrible.... I called my brother who lived just literally around the corner for me he ran to my house and when I opened the door he was like whoa.... Eli! It feels scary in here like the environment he said was scary something out of a horror movie he helped me pack some of my clothes while I called my boyfriend and told him what happened I was out of there at that night... I wanted to move but being young adults with a new baby we could not afford that. So for the next 3 months when my boyfriend would get ready to leave for work I would pack me and the girls some clothes to sleep at my brother’s house and that how it was for a while till things started to feel safe around there. it seemed as if it calmed down. Then life went on good until I get a call from my boyfriend saying something bad horrible to his brother in law. It was March 26th of 2012, I will never forget that day.. because I had a miscarriage years prior to this relationship.. so that day will always stay in my head. WWA (We Want Answers) Team!